Back when the craft beer scene in the States was still in its infancy, brewers could raise an eyebrow—and generate some PR—by integrating unexpected ingredients into their brews, even if some of some of those items actually trace back to tried and true European styles. Now it’s common for brewers to use fruit and spices and brett. With near dizzying speed, the new normal has quickly expanded to include things like hemp, sage, and chili peppers. Rogue even made it okay to harvest yeast from a brewer’s beard. But there are still a handful of breweries pushing the limits of oddball ingredients. Here are a few that still manage to stand out. Using coffee beans while brewing an imperial oatmeal stout makes perfect sense. Those rich flavors perfectly complement each other. But Mikkeller upped the ante by sourcing one of the world’s most expensive coffees, which is…processed…by a Vietnamese variety of a weasel-like civet cat. Apparently these felines only eat the best, ripest coffee berries they can find, and enzymes in its digestive system breaks down the bean. Workers collect the bean-rich droppings and use it to process the rare Civet Coffee. It should be noted that Japan’s Sankt Gallen Brewery followed a similar sourcing path for their Un Kono Kuro stout, only they get their coffee beans from Thai elephant dung. Marketed as a special New York-only release from Captain Lawrence Brewing, the Cookie O’Puss stout made with Carvel Ice Cream’s chocolate crunchies dropped this March in honor of St. Patty’s Day—the cocoa flavor being a natural fit for this style. This release partnered with the more-evenly-distributed Cook Puss Birthday Beer, which incorporates vanilla ice cream to make a sweet, smooth-drinking Milkshake IPA. Two Florida brewers—Hidden Springs and Arkane Aleworks—merged their love of all things Krispy Kreme with their craft beer-making. As you might expect from brews made with actual donuts—one using two dozen glazed, the other with two-dozen cream-filled—the stouts turned out a touch sweeter than normal, with a big 12.5% ABV. And this ain’t the first time the two brewers looked to sweet stuff for inspiration. They also make beer with Peeps, 7-Eleven donuts, peanut butter, and a Gatorade-infused Berlinerweiss. Maine-based Oxbow brewing probably felt obligated to brew a beer with the live crustacean. And the Saison Dell’Aragosta is precisely that. Made in collaboration with Birrificio del Ducato from Parma, Italy, this blonde farmhouse ale is brewed with fresh, live Maine lobster and sea salt—flavors that don’t dominate, but definitely can’t be ignored. Maryland-based DuClaw Brewery was inspired to make one of their newest releases by a pastry served at nearby Diablo Doughnuts called “Unicorn Farts”—a diabetes-triggering white-frosted donut topped with Fruity Pebbles and…more frosting. 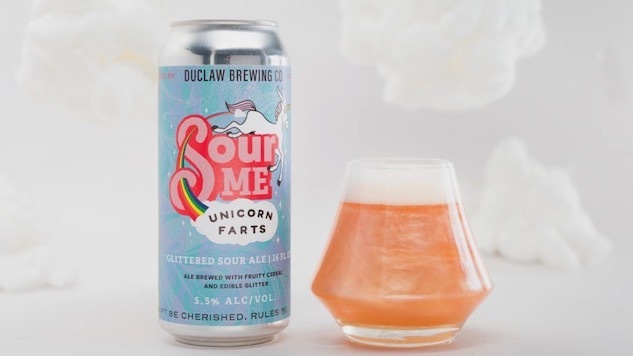 But rather than using the actual donuts, they opted for edible glitter—because, unicorn farts—alongside “fruity cereal.” Thankfully, DuClaw went the sour route, making the 5.5 percent ABV can deceptively tart for something that screams sweet. Herndon, Virginia-based Aslin Brewing makes some of the best beer in the Washington, DC area, and while their IPAs are particularly coveted among locals, their sour game is also strong. For their Disco Biscuits, they wanted to create “a small party in your mouth,” which inspired them to use coconut, chocolate, and graham crackers alongside tart limes. It drinks almost like a desert beer—or a coconut-fueled key lime pie. One glass? Quite the journey. Two? Might be too much, unless you crave the taste of graham crackers as an aftertaste. Brewed for the annual Thorri Festival each winter, Icelandic Stedji Brewery uses a giant whale testicle—15 to 18 pounds—that’s been smoked in sheep’s dung to make their seasonal Hvalur, a porter with hints of caramel and a smoky aftertaste. They source the key ingredient from Hvalur hf, the only Icelandic company allowed to hunt fin whales each year, and the beer continues the country’s proud tradition of embracing other bold dishes like fermented shark, cured whale fat, and ram’s testicles. Not to be outdone, the U.S.’s own Wynkoop Brewery has made a “meaty, foreign-style stout” dubbed the Rocky Mountain Oyster Stout, brewed with Colorado base malts, roasted barley, specialty malts and hops—and 25 pounds of freshly sliced and roasted bull testicles.